Readers of the UK's Guardian heard from Cornel West yesterday about Barack Obama's failure to stem the tide of police brutality in America--brutality that is overwhelmingly and routinely directed at citizens of color. West is permitted to tell the citizens of other countries about Obama's spineless complicity with the institutional racism of our police state, but the mainstream media in America feels no obligation to quote West when he correctly observes that "Whatever solidarity [Obama] does offer is just lip-service to suffering, but he never makes it a priority to end that suffering." West concludes his article by expressing his support for Jill Stein and the Green Party--a position which is not only reasonable, but necessary in light of the Democratic Party's sustained betrayal of people of color through its support of a deeply discriminatory war on drugs, its decades-long promotion of prisons-for-profit, and its insidious neoliberal dedication to the project of talking endlessly about the intersectionality of race and class in America without lifting a finger to address that problem. West's argument about supporting Stein was so powerful precisely because he grounded it in the context of the killings we saw in Louisiana, Minnesota, and Texas just last week. The teaser that UK readers saw concerning West's article was completely accurate as a summary of his argument: "Obama has failed victims of racism and police brutality." But how have our media outlets in the US presented West's argument? In almost every case, West's nuanced and powerful condemnation of Obama's inaction has been reduced to his endorsement of Stein. 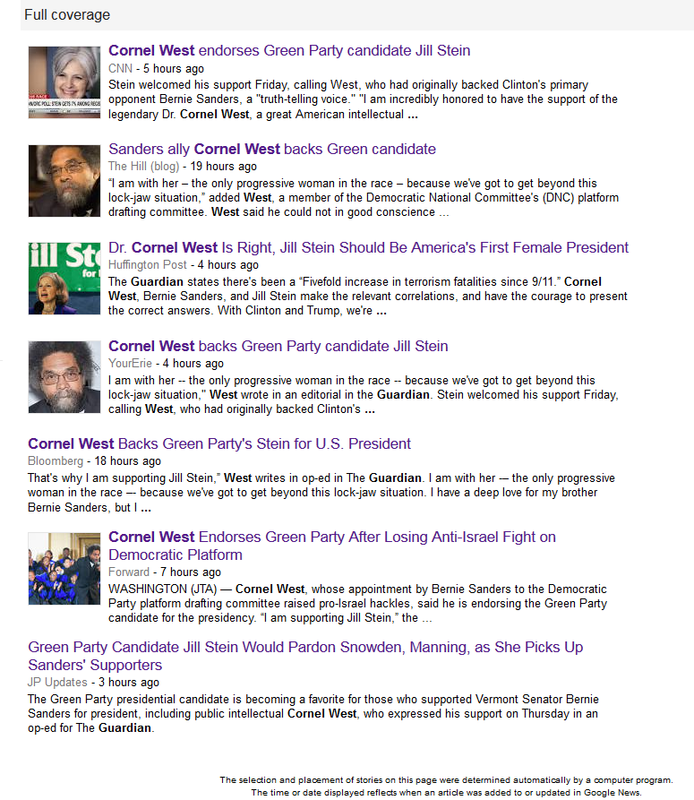 CNN says: "Cornel West endorses Green Party candidate Jill Stein." The Hill says: "Sanders ally Cornel West backs Green candidate." Bloomberg says: "Cornel West Backs Green Party's Stein for U.S. President." As you can see, not one article makes the slightest attempt to connect West's endorsement of Stein to the recent events that highlight the very real phenomenon of cop-on-black crime in America. This glaring omission exposes our neoliberal media establishment for what it is. Instead of telling us why West endorses Stein, our news outlets focus entirely on the fact that he endorsed her, which is simply another implicit way of pushing the argument that Democrats are somehow on the side of people of color in this country simply because they are less hateful in their speech (and less prone to race-baiting demagoguery) than their Republican counterparts. Meaningful debate on the intersectionality of race and class in America is long overdue, but that debate will never happen if the most important speakers can only be heard across the pond, which is the path to which we have apparently committed ourselves whether we elect Trump (whom West calls a "neo-fascist catastrophe") or Clinton (whom he identifies as a "neo-liberal disaster").